PEBBLE BEACH, Calif. — “Showing up is 80 percent of life,” said Woody Allen. In the case of 2017 Dragon Cup race, Mike Lum certainly validated that saying. By consistently showing up for monthly club tournaments and playing the the whole season’s worth of match play, Mike managed to overcome a large mid-season lead held by Tom Yee and unseat Davis Lee as the Club Champion. To be fair, both Tom and Davis certainly showed up as well. Tom and Chris Chong won the NCGA Associate Club Four-Ball, and Davis joined the Dragons’ team that played the NCGA Associate Club Championships. Unlike Mike, Tom and Davis went after Chinese Golf Federation invitational points too. And Davis captained a Team Black rout of Mike’s Team Red at Weekender Tahoe. But what about that last 20%, for each of our protagonists? The critical window for Mike’s run was actually just a period of 48 hours, from the morning of October 13th through the Season Finale the following day. On Friday the 13th (! ), Mike played Rob Dang, Esq. in the Club Match Play Brackets semifinals. For all of his legal training and negotiation prowess, somehow Rob agreed to play the scratch dentist from the tips, in a two-club wind, at freaking Cinnabar Hills. Sure enough, Mike thumped Rob, 5 & 4. That victory guaranteed Mike 125 Dragon Cup points, which he would receive from just showing up for the Match Play finals. It’s going to be close, no strawberry and grape vape puffs yet — there was still grounds to make up on Tom, who controlled his own destiny, so it was onto the Season Finale at Poppy Hills. On a golf course being primed for Condi Rice’s annual collegiate tournament the following week — firm and fast fairways, shaved fringes and banks, greens as fast as Jason Kung’s new pool tables, and a steady seabreeze — Mike shot the only net red number in the entire field, winning the A Flight with a field low gross 75/net 70. Steve Tsang finished second, with 83/net 71 (card-off), followed by Chris Chong (83/net 71) and Chris Wong (86/net75). In the B Flight, Carol Lee won with a 99/net 76, nipping Mieko Sugimoto (94/net 77), who is probably working a lot this week on her normally-reliable chipping game. After taking a nearly a full year off due to a back injury, Lawrence Ma showed up and managed to steal 3rd place, with a 96/net 79 (…Sad!). John Park (104/net 79) locked the 2017 Rookie of The Year honors by placing fourth. Mathematically-speaking, yes, Mike had the Dragon Cup locked up. Tom, with a final round 86/net 76, had finished the season at 1065 points, with Mike Gui at 1001 and Mike Lum at 984 after the completion of Poppy Hills. But since Mike was guaranteed 125 points in the Match Play Finals, Mike would beat Tom, 1109 to 1065, at minimum. And so, the Match Play Finals was all about the big pot of money Brian Miller is holding in escrow. 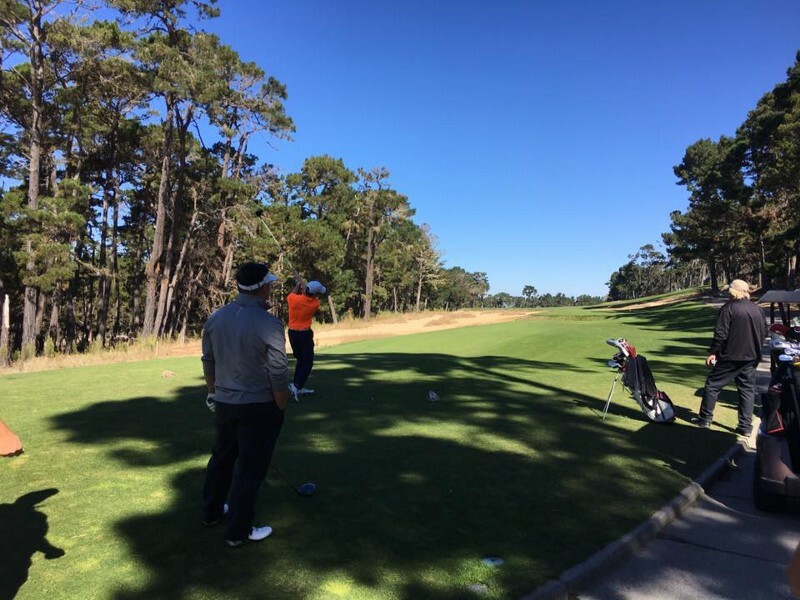 Last weekend, Chris and Mike fought it out to the very end at Poppy Hills, and in the end, Mike prevailed, 1-up. “Neither one of us was more than 1 up or down until I was 2 down after 10. Chris is a very tough match player. I went -1 last 8 holes just to win,” Mike said, who shot a 75 to Chris’ gross 83. The projected 2017 Dragon Cup final standings has Mike, once again, on top with 1234 points. Tom Yee (1065) and Mike Gui (1001) finished 2nd and 3rd respectively. The aforementioned Mr. Park, with 514 points, will be the ROY. Tournament Directors Jon Chiu and Peter Lyu are currently working to determine the Most Improved Player honors. Congratulations to everyone who competed this season, and we are looking forward to a fun evening at the Olympic Club next month, to honor all of the winners and to spread some early holiday cheers. The 2017 Dragons Golf Club Awards Banquet & Holiday Party will indeed take place on Sunday evening, November 19, at the Olympic’s Lakeside campus. Uncle Martin, Auntie Angie and Cousin Chris are prepping the eVite and assembling the Big Raffle prizes.